Ancient Sri lankan boundary books known as Kadayim poth, state thus: “ In old times, after the Rávana war there came from Kuru Rata to this island a queen, a royal prince, a rich nobleman and a learned prime minister with their retinue and by the order of king Ráma dwelt in this place called on that account Kuru Rata. In the ..... year of our lord Gauthama Buddha, Gajabahu who came from the Kuru Rata settled people in the (second Kuru Rata) calling it Parana Kuru Rata. Into another place he sent a thousand persons and gave it the name Aluth Kuruwa. According to tradition Karava king Gajabáhu (historians with other motives have attempted to misidentify the king as Gajabahu I and place the event in the 2nd century, the king in reality is Gajabahu II who ruled Sri Lanka in the 12th century. The story which has been displaced and thereby discredited by these historians makes much sense when it is placed in it's rightful context in the 12th century) invaded the Chola country in India and recovered the Sri Lankans taken away as prisoners of war during his Father’s reign. The Silappadikaram states that king Kayavágu of Sri Lanka invaded South India and brought back 12,000 Sri Lankan captives taken by King Cenkutuwan Seraman during the reign of Kayavágu’s Father Vankanásika Tissa. This is briefly confirmed in the Dipavamsa and Mahávamsa and in more detail in the Rájavaliya. In addition to the 12,000 Sri Lankan captives, the victorious Gajabáhu also brought back the golden anklet of goddess Pattini, the bowl relic of the Buddha taken away during the reign of king Valagambáhu and 12,000 South Indians as slaves. According to legends, ﻿King Gajabáhu ﻿was the initiator of the Pattini cult in Sri Lanka. The site of the original Pattini Devale set up by Gajabáhu lies, long forgotten, in the village of Pihituma in Mágam Pattuwa of the Parana Kuru Kóralé. The only traces remaining of the Dévale are the huge Ná trees, seventeen in number. These trees are much larger than the Ná trees at the presently popular Pattini Dévale at Navagamuwa which is of later origin. The site of the original Dévále has now reverted back to the Halwatta Kapurála family whose claims were authenticated by an ancient ola manuscript in their possession. The ola describes the installation of the family as Kapurálas of the Pattina Dévale in the Parana Kuru Kórale upon their landing on the western coast of Haláwatha, present Chilaw. They are now Kandyans. Under Portuguese rule the ancient Pattini Déváles in the western coast of the Kotte kingdom had been replaced by St. Anne’s churches whilst St. Marys’ replaced Máriamman Kóvils. Some of the St. Anne’s churches coming from Portuguese times are at Wattala, Bolawalána Negombo, Palangaturai and Talawila. St Anne’s Kochchkade north of Negombo is significant as it is located in Palangaturai, the harbour named in honour of Palanga, the consort of goddess Pattini. 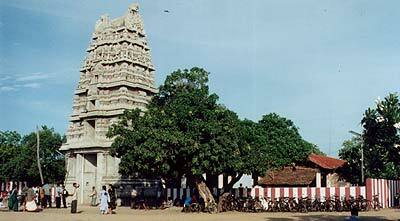 Goddess Pattini was a popular deity in Jaffna too until Arumuga Navalar – The man who ceaselessly worked against all other Tamil castes to elevate the status of the Vellalar caste and was therefore promoted as a ‘national hero’ by the Vellalar caste – expelled her from temples in Jaffna by claiming that she was a heretical Jain goddess. 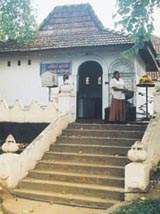 The former association of the Karavas with the Pattini cult is still preserved in a few Karava family names such as the Pattini-Hennedige clan name of the Rodrigo family of Panadura; ancestors of other Karava families known as Pattini Muttas and some ancestral karava homes known as Pattini Gederas. Some historians interpret the name Gajabáhu as ‘upper arms of elephantine size’. According to Indian and Sri Lankan 'creation of mankind' legends, the Kshatriyas originated from the arms of the creator Brahma. The other three varnas Brahmana, Vaisya, Sudra known in Sinhalese as Bamunu, Velenda and Govi are respectively said to have originated from the mouth, thighs and feet. The real meaning of Báhu according to the Ganadevi Hélla is ‘solar’ denoting Suryawamsa. Since Gaja is synonymous with Kuru as in Kuruwe elephant department, Gajabáhu means Kuru Suriya. The form of dance now known as Kandyan dancing was originally called the Kohomba Kankariya and in royal times it was part of Pattini worship. Goddess Pattini’s husband Palanga had been executed and resurrected under a Kohomba tree and hence the name Kohomba Kankariya. 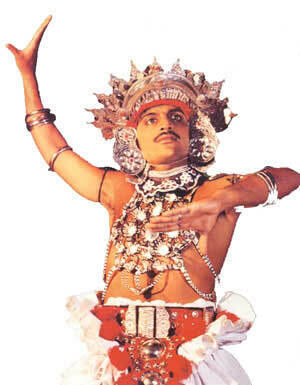 This dance was called the Digge Netumaduring the time of Sri Lankan kings and it a sacred dance strictly performed inside the Pattini Devale only. The costume is a artistic rendition of the chainmail war armor (Note the breast plate (avulhera), shoulder guards, helmet etc) of the warriors who invaded south India to bring the golden anklets (pattini salamba) from a temple there. The dance is a stylized war dance of this invasion and victory. This history is being covered up by antagonists to efface the Karava connection. 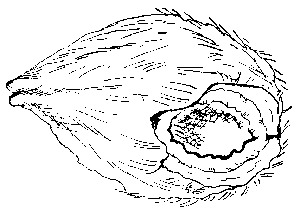 The Sinhalese ballad Ankeliya Upata relates Pattini's birth in a mango and her marriage with Palanga. Strolling in the orchard one day, they see a sapu flower (Micheliya Champaka). Palanga gets up a ladder, and tries to hook the flower for his wife. He fails to pluck it. His wife comes to his help with a sandal stick hook. The hooked sticks become entangled and they pull each other. Palanga's stick snaps. Pattini and her friends dance with joy. Each contestant has a pair of horns-the forked horns of the sambur. Strength and capacity for resistance are the qualities looked for in selecting a well matched pair of horns. The preliminaries to a contest are most elaborate, with a technology and prescribed ceremonial ritual, closely observed. The entire proceedings last from early morning to late evening. The party that wins reclaims the winning horn from its trappings, wrap it in silk, decorate it with garlands and carry it aloft in a procession under a canopy thrice, around the arena of the contest and over the whole village, to the resounding shouts of the accompanying crowds of villagers. It is nightfall as the events close. This ceremonial contest is held for seven days in succession. Beginning as a simple co-operative effort, time has evolved it into an elaborate two party organization, of harmony as of conflict, with an abiding place of its own in rural social life. Yet another development of the Pattini cult is the Pol-Keliya, the competitive sport of smashing coconuts. The two opposing groups -- the Udupila and the Yatapila, stand on either side of a rectangular open field, each with a stock of the special variety of pora-pol, "fighting" coconuts. One of the parties pitches a nut over to the other side, where one of the latter, stands vigilant with a coconut held in his hands. A well aimed throw finds its mark in the hands of the man on the opposite bank, who receives it with all the force of the impact, over the coconut he holds. Whether the impact results in smashing it or not, depends on the resistance of either of the nuts. One or the other often cracks or breaks. The smashed nuts are discarded. Whichever side has the largest stock of nuts intact at the close of the contest, is the winner. The annual water cutting rituals performed at the end of all Sri Lankan pageants is a commemoration of Karava king Gajabahu's Indian invasion. According to legend king Gajabahu struck the ocean with his royal mace and parted the ocean for his warriors to crossover to India. As such most Sri Lankan pageants (and even the Kandy Perehera which is now preceded by 4 other religious icons including the Tooth relic), had initially been pageants in honour of king Gajabahu's victory. Hence the commencement of all these pageants with the planting of a 'Kap' and conclusion with a water cutting ceremony. The 'Govigama only' Siyam Nikaya monks, who diring British times took control of all major Buddhist shrines in Sri Lanka, have now invented new history for the water cutting ceremony; and as with all other karava history and traditions, effaced the origins of the water cutting ceremony and its connection to Karava king Gajabahu.